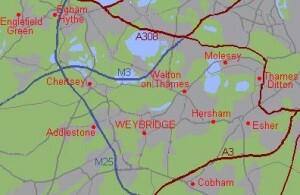 The Weybridge Deanery is the umbrella group for the Catholic parishes in North West Surrey – including St Anne’s parish in Chertsey. The map shows all the parishes that are part of the Deanery. It is part of the Diocese of Arundel and Brighton. As part of the Deanery’s ‘Looking to 2020’ it believes that the parishes within it need to work increasingly closer together. Where appropriate, events in one parish will be open to other parishes in the Deanery.